As you know I’ve been working towards creating my own home office or workspace so this Guest Post is very timely and gives us a few different ideas to use when creating that all important space. 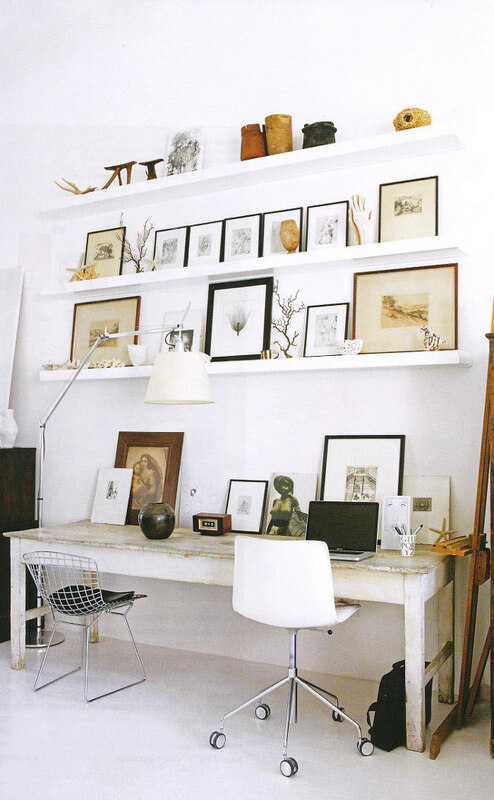 Home offices are usually quite small spaces; you don’t really need too much room for a desk and a chair. However this doesn’t mean that you shouldn’t spend some time beforehand decorating it to look cool! The better you make it appear in advance may mean that you don’t quite mind spending so much time in it. It is much nicer to be able to chill out and work in your own space than having to spend the best part of your evening stuck in the same building. Choose a really funky wallpaper for a feature wall; maybe go for a city skyline to pretend you are working in a top office overlooking New York City! Of course with any office, although it may sound boring, you need to make sure the ergonomics and set up of the room is correct. Ensure that any windows are to the side of you when working, definitely not directly behind. Also make sure that you have a high quality office chair such as the designs from MDM Furniture, the chair should be set to a particular height which means that you are looking straight ahead at your laptop or monitor. Your feet should also be able to rest comfortably flat on the ground. Choose quality lighting to make sure you do not have to strain your eyes when looking at the screen. Just because you sit in this room to do work, doesn’t mean that it has to feel like the office you work in during the day. Make sure to put a few plants in the room, a bit of greenery will add a sense of calm and bring a little bit of the outdoors in. You could also place a few family photos and picturess of you and your friends up on the walls to make it feel more like home. Add lots of accessories, as well as a splash of colour, and it will not only create an office space but also somewhere you might enjoy just going to chill out. You can go and sit at your laptop out of hours, maybe enjoy a bit of peaceful online shopping or looking up more interior design tips. Fab ideas!! Ergonomics so important..watch that back! My top tip would be reevaluating the space, and regular decluttering. That makes such a difference to me. I have to agree with Becky. Details like ergonomics are often far more important than we realize. If I could add anything to the already stunning article, it would be to keep things simple and functional. It’s nice to have a beautiful home office, but it is even nicer to have one that is pleasant to work in. I have learnt a lot from your story. My office room is small space, so it needs some changes. Thanks for the idea. Shades associated with blue, lavender, and green are considered calming colors since they seem to possess a relaxing effect on the room’s residents. These are ideal colors to add into the home design for the bedroom or bathroom (especially the actual bathtubshower area) since these rooms are generally associated with relaxation. Utilizing colors out of your past can create a nostalgic as well as cheerful atmosphere, bringing back happy memories out of your childhood. Experts have noted that using these colors inside your kitchen is especially effective with regard to bringing back fond memories invested with family during meal occasions. Fantastic information, Jen. I really need to do changes with my office room since I got fed up from my room settings. Due to this I am unable to do my work with full concentration. I will implement these ideas which are specified in this blog. I think mainly I should modify the color of my office room. Thanks a lot for providing this useful information. I agree that ergonomics and lighting are extremely important in any home office. So is the decor. The only thing I would personally add to this amazing (really amazing) article is the positive impact plants, especially air purifying, plants can have on your health. Thanks for sharing this, I’m off to hang some photos on our office wall! Thanks for sharing these amazing ideas. I am planning my home office.